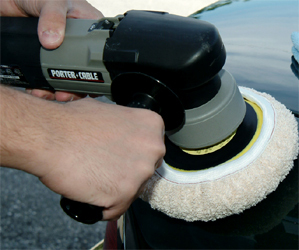 Top off your pad with a terry or microfiber bonnet for a deep, polished shine with out the all the muscle effort! Protect your polishing or finishing pad with a snug fitting bonnet of 100% cotton terry or high-tech microfiber. Both are reversible, machine washable and are your ticket to a clearer, deeper shine. You’ll get conflicting reports on exactly how to use either the microfiber or the terry bonnet. I’ll give you some suggestions, and tell you how I use them, but I’m not the last word on the subject. Before we go there, let’s examine the facts. The terry bonnet is 100% soft, absorbent cotton, like the traditional terry towels (back in the days before microfiber took over) that were used in a variety of ways, safely, on the surface of the car: Drying, applying or buffing away a wax or polish. 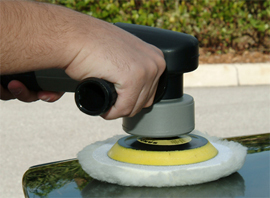 Whether polishing or waxing, a terry bonnet can serve the same purpose; but, instead of your arm and hand doing the majority of the work, the polisher or buffer will. The same applies for microfiber bonnets. 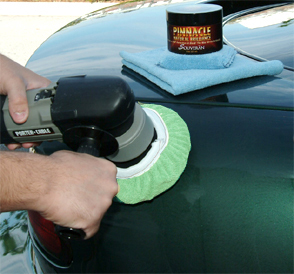 You would use a microfiber applicator to wipe your polish or sealant onto your paint, rub it in, or buff it away. It’s especially excelling at final buff-downs, adding a finishing, sparkling touch. When you assemble your buffer and backing plate, add a finishing pad, then top it with a microfiber bonnet, you’re essentially putting together your own electric powered applicator or polishing pad, saving you time and energy. The fabric is strong and non-abrasive, yet has polishing properties to deliver an outstanding gleam. Everyone eventually develops their own routine of what is comfortable to them and what they feel works the best for their particular tools, products, vehicle and environment, but I’ll share mine with you anyways. I like to use the terry to apply both polish and wax. With a little practice (unless you’re a natural) you’ll get a nice, even, smooth haze. Then I buff it by hand—I actually enjoy it! Finally, I switch to a microfiber bonnet and polish the entire car, from bumper to bumper. I believe that I arrive at the best results with this procedure. Variations on it are many, so feel free to experiment. Within the parameters of safe use for terry or microfiber, use them as you see fit or best suits your preferences or needs. With either one, they’re 100% safe for your surface, so, I suppose there is no right or wrong way to use them. For extra cushion beneath your bonnet, layer it with the lamb’s wool pad (which also has abrasive polishing characteristics, when used alone). Buffing is gentler and easier with the additional padding it affords. The lamb’s wool pad allows for even distribution of pressure against the surface, makes edges and curved areas turn out much better, and prevents the bonnet from tearing. You’ll notice how much smoother the machine seems to operate. It’s not, actually, the friction is enhanced because the ultra-soft lambs wool is so forgiving when uneven pressure is applied. This is a safety feature for anyone, but can be especially important to the novice. You’ll get a perfect finish every single time.